While shopping for a new wallet, this Chanel wallet came into my radar the other day. It's taller than the usual long wallet (est. 7.5" x 5") but there is enough room inside to put a thin cell phone, lipstick and a couple keys to double as a clutch. There is a zip compartment inside with 6 credit card slots to hold a gal's credit cards and receipts. Also with the chain, this wallet can be used as a small cross body bag (great for traveling) or the chain can be double up to wear as a short shoulder bag; 3 bags for the price of 1, now I can totally justify the price. I am sticking to the story. Is this a savvy wallet/clutch for you gals? Which do you like more, patent or lambskin? SG is leaning toward patent leather. Oh so cute! Love the color! Chanel I love you... please come over to my house! This is such a cute bag, I think patent. Kathy. I think it's really a savvy buy. it's pricey but a gal will always love it. mmm...it is gorgeous! it is classic so like you said, you would love it forever. 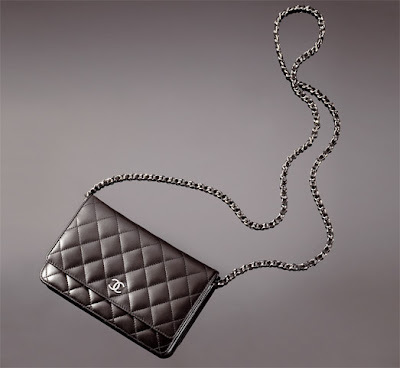 i think i need (not want) something chanel...i mean come on, my initials are CC! Ah, this is like the ultimate dream purse for me...so chic, and a little 80's -- gorgeous!